I've actually found this to be one of the better Franco Zeffirelli's productions (just acts one and two, act three is a disaster) but I can still understand what you mean. This cast does look like a better Turandot cast than one usually sees at the met these days (I generally consider myself a fan of Theorin, though her vibrato in the middle can get distracting). I would recommend the salzburg dvd with Berio's (much more satisfying) ending.Musically it's not much but the production in imo genius! This is one Met production that I would couple with the hideous Aida as one I would rather scoop my eyes out with a spork than go see. appealing to me and Giordani was on his best game. I am totally convinced that the airwaves hate him. He needs to be seen to be appreciated. His highs were so secure and nothing forcey. I haven't enough words of praise for Irene Theorin as Turandot (they all pronounce the "T" by the way) who really nailed it and her "in questa reggia" was spot on. This is one tough role and she got it right. The Zeffirelli staging was breathtaking and grandiose. Say what you will about the "over-the-topness" of his productions but he sure knows how to deliver pizzazz. (well maybe that red lace stuff in Trav I could definitely do without). A totally fulfilling night at the Met. Why Gelb is thinking of deep-sixing this production, I'll never know. The place was packed and the audience was actually raucous in its enthusiasm for this one. Hi, Zerbinetta. I've been a casual reader of your site for some time, and find your commentary to be consistently witty and erudite. I've noticed, however, that you seem especially sensitive to opera's depiction of ethnic minorities. First there was your (in my view, bizarre) insistence on the anti-Semitism of Robert Lepage's "Siegfried." And just recently, you singled out racial baggage in the Met's new "Tempest." Now, I can see what you're getting at with "Turandot" – but your ire is misplaced. You speak, for example, of "cultural appropriation." I don't think there's anything inherently insidious about using a few pentatonic melodies to suggest an "Asian" atmosphere, ham-handed as it may be. 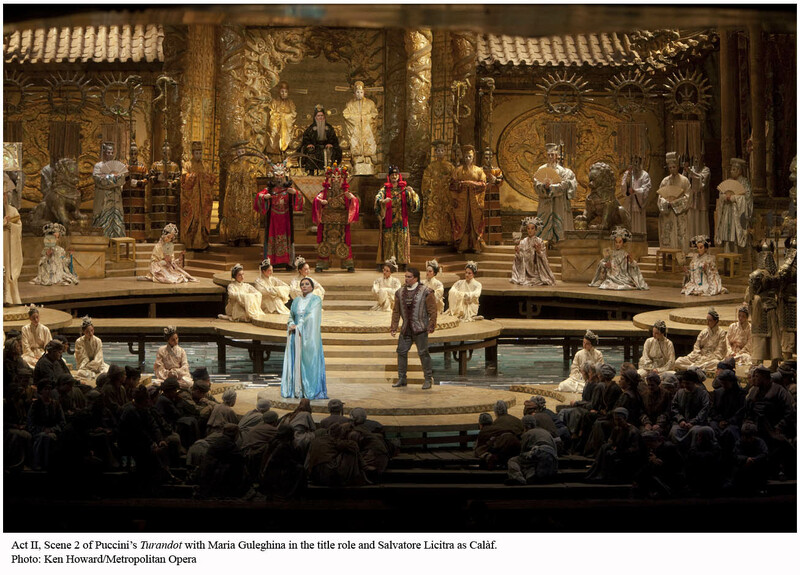 And I would argue that the elements of "Turandot" you find offensive – the "mindless" crowd scenes, touches of Gilbert & Sullivan in the scene with the ministers, the tacky chinoiserie of Zeffirelli's sets and costumes – are not, as you suggest, tainted products of cultural imperialism, but rather expressions of Puccini's dramatic élan. The man was, after all, a consummate showman, and saw it as imperative – especially as a so-called "veristic" composer – to provide such bursts of local color, which serve to draw the audience in, to contextualize the story, and, let's face it, are just plain fun. You can't deny that "Gira la cote" is damn catchy. I suppose you can criticize Puccini for hewing too close to stereotype, but he was a composer, not an anthropologist. There's no denying that opera is rife with ethnic stereotypes; it's one of the (many) conceits of the genre that must be accepted in order to be enjoyed. One of opera's shortcomings is that the constant pursuit of Big Emotion often leaves little room for the kind of subtle, novelistic characterization that could otherwise refine and humanize; hence the preponderance of "types": Hero, Villain, Lover, Sidekick, and so forth. And let's not forget that even Puccini, shortly before his death, expressed frustration with the story of "Turandot"; indeed, the characters are more archetypal and less sharply etched than those of his earlier masterworks. But I digress. It's a work I love, and it just seems silly and sanctimonious to get worked up over the particulars. I would love to get your thoughts. P.S. Speaking of racism, have you ever read Adorno's critiques of jazz? The man had more than his fair share of biases. #6, if you look up what I wrote about Lepage I never accused him of being anti-Semitic. I accused him of using *an image that often can be anti-Semitic* which thus should be avoided. I think you other points could similarly use a greater degree of nuance. Also, the Adorno thing was a joke. I was going to put a footnote saying "don't believe everything you read on the Internet," but decided that would make it less funny. Alas, I should have. This website just got deleted from my favorites. PC criticism should stay out of the opera house. Anon #9, you seem perfectly capable of guiltlessly enjoying your privilege in the opera house. But at my blog I consider it my job examine it. Good riddance and I'm glad I bothered you.